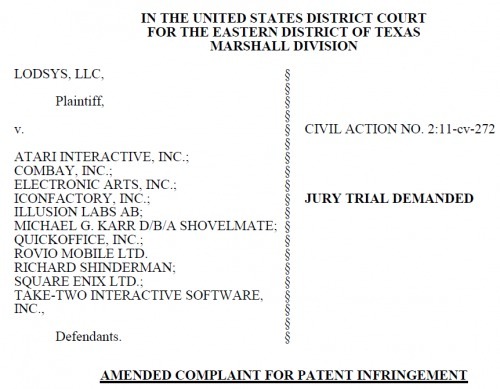 Lodsys has amended its complaint against app developers, dropping one developer (Wulven Games) and adding five including: Rovia, EA, Atari, Square Enix, and Take-Two Interactive. FOSS Patents notes that Lodsys is still not impressed by Apple's assertion that its own license to Lodsys's patents extends to its app developers. I also pointed out that Apple's "exhaustion" theory is not necessarily accurate. Also, Lodsys may be able to capitalize on contractual commitments that might preclude Apple and Google from challenging Lodsys's patents and the related infringement allegations.